Bangalore is an incredible city and the largest IT hub in the country today that has a lot to offer its inhabitants. There is something beautiful about this city that just comforts you and that is precisely the reason why Bangalore is one of the most loved cities in the country today. The real estate market in Bangalore is booming today with a number of residential as well as commercial projects in different parts of the city. 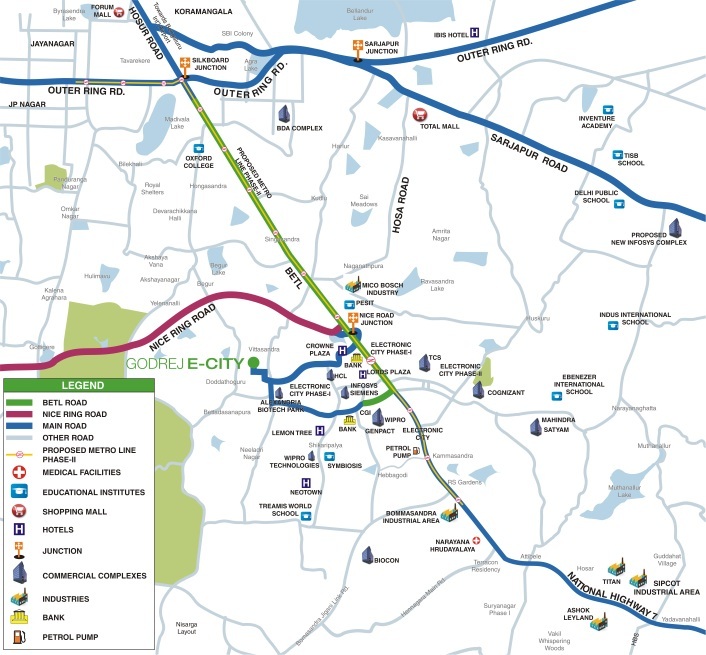 Godrej E City Phase 3 is a new residential project in Bangalore by Godrej Properties that has a lot to offer. Extended over beautiful acres of land, this development contains magnificent towers that offer 1BHK, 2BHK, 2.5BHK and 3BHK apartments of different configurations that are high on luxury and comfort in every corner. The apartment area sizes start at 638 sq. ft. and go up to 1633 sq. ft., providing ample luxury space for all your needs and requirements. Experience a new world of luxury and comfort that is right at your fingertips! Luxury and comfort is what Godrej E City Phase 3 Bangalore is all about. This residential development offers a range of high-end internal and external amenities that will simply blow your mind. The apartments are spacious, crafted to perfection and contain branded fittings and furnishings, premium doors and windows providing fabulous views, grand kitchens with multiple provisions, high-quality flooring, enhanced safety features and more. The external amenities at this development are truly divine and there is something for you and every member of your family. They include a clubhouse, gym, meditation centre, swimming pool, day care centre, conference room, convenience store, multipurpose hall, multiple sports facilities and a play-area for your kids, gorgeous landscape garden, open space, 24hour water supply, efficient power back-up for emergencies, strategic car parking, safety features and the list goes on. Located at Doddathogur, Electronic City in Bangalore, Godrej E City Phase 3 Electronic City does come in close proximity to a number of your daily and emergency places like schools, colleges, hospitals, medical centres, general stores, supermarkets, malls, shopping centres, cafes, restaurants, clubs, pubs, cinemas, banks, ATMs, public transport and a lot more. This development is where you will experience total comfort each day that will satisfy your soul. Starting at Rs.29.97 Lakhs and going up to Rs.76.73 Lakhs, the Godrej E City Phase 3 price list is simply amazing and totally affordable. Godrej Properties is known to provide high-end living at an affordable cost and this development is another addition to their pack. You can choose from a number of payment plans according to your convenience along with home loan facilities, NRI services and a lot more for a convenient purchase. 70% of the project will be covered in landscaped gardens and open spaces.